Tom Newcliffe (Calvin Lockhart) hosts a number of socialites at his mansion. Among his guests are a disgraced diplomat (Charles Gray), a black listed pianist (Michael Gambon), a werewolf expert (Peter Cushing), and a recently jailed artist (Tom Chadbon). Newcliffe has surrounded the place with cameras and microphones. He announces that one of them is a werewolf, and he’s going find out whom and kill them during the next three nights of the full moon. The Beast Must Die plays out like a whodunit mixed with The Most Dangerous Game and a side order of werewolf. Much of the marketing would have you believe that this is a blaxsploitation film, but it really isn’t. It would also have you think that Peter Cushing is the main character much to Calvin Lockhart's disservice. Calvin Lockhart is great as the lead; he has a forceful presence that bubbles over into obsessiveness. Peter Cushing seems to be really relishing his role as the lycanthropy expert, giving his character lots of flourishes and quirks. The actual werewolf itself is a strange one, it’s basically a big dog and there is no prolonged transformation. One second you’re a person and the next you’re a bloodthirsty monster. 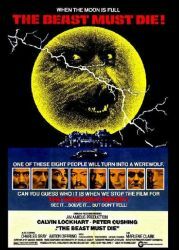 The oddest thing about the whole production is the Willam Castle-esque ‘Werewolf Break’ that happens at the climax of the film, allowing the viewer thirty seconds to guess who the werewolf is. The open scroll states that all the proper clues are there to be able to make a correct deduction but I beg to differ. Maybe I’m just mad because I guessed wrong.